Picture this…lounging in your backyard on your comfy patio furniture, you have your favourite book in hand and you are settled in for a quiet bit of alone time. Or perhaps your friends have popped over for an impromptu visit. 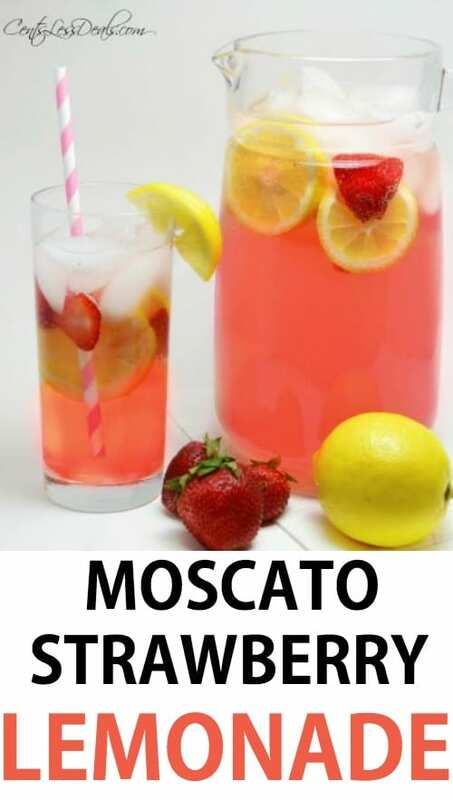 In either scenario, you have a pitcher of Moscato Strawberry Lemonade on the patio table. So cool and refreshing, perfect to enjoy alone or with friends! Pin it your BEVERAGES BOARD to SAVE it for later! 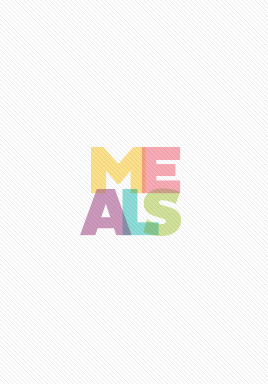 One thing that is certain, summer is the time for simple recipes. 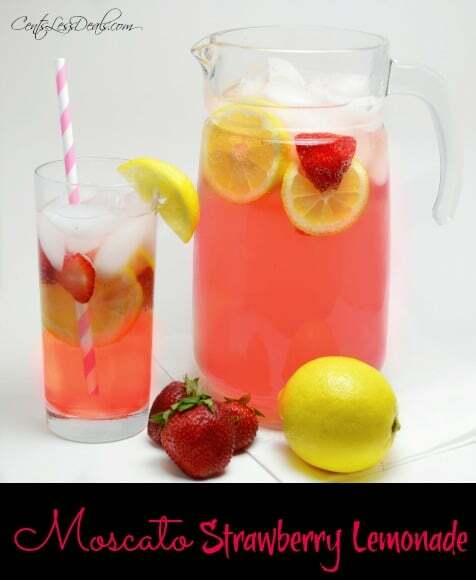 This homemade Strawberry Lemonade recipe is certainly simple and so delicious! 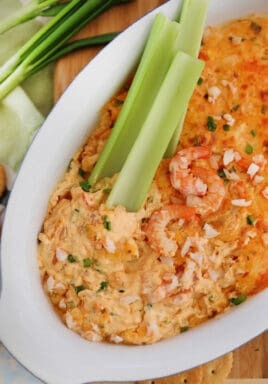 The ingredients are easy to keep on hand for any occasion and so easy to prepare! I love pink lemonade, however you can use traditional lemonade as well. Your favorite vodka, whether it is flavored or plain, can be added either way and is a delightful way to spice up this lemonade! I like to keep frozen strawberries readily available in my freezer for many things like breakfast smoothies or a fruit topping on angel food cake, but they are also perfect to add to this homemade lemonade recipe. Use the frozen strawberries in place of ice cubes for a very pretty drink. This can be prepared ahead of time and frozen as a slush. Simply add all the ingredients together and freeze. The alcohol will keep it in slush form so you can simply scoop out what you need. 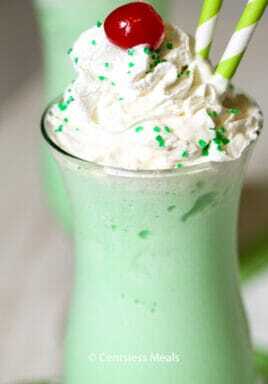 You can add a bit of club soda or other carbonated soda to this frozen concoction to create a wonderful slushy drink. This homemade Strawberry Lemonade recipe is certainly simple and so delicious! 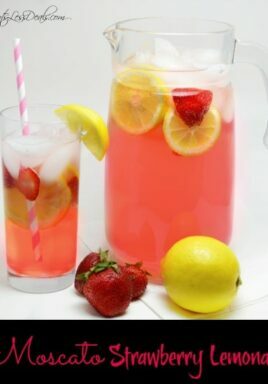 In a large pitcher, add bottle of pink moscato, lemonade, and the strawberry vodka. Always refreshing and such a treat on a hot summer’s day, this Moscato Strawberry Lemonade Recipe is sure to please! Be sure to keep these ingredients handy because I know you will want to make this again and again! Thank you Amanda, so glad you loved it! Congratulations to your daughter and your new son-in-law! Hi what kind of lemonade do you use? I use any lemonade that I have on hand. Enjoy Nataylah! Im making this in a 3 galloon dispenser. Do you know how many bottles of each I need. You use a 750 ml bottle of moscato. I’ve made this many times and everyone loves it. Very refreshing. Yes, what size bottle of moscato?? What size bottle of Moscato? ?